Welcome to Carleton Residence! As a student, living in residence at Carleton University offers you the chance to become part of a vibrant community with many opportunities and conveniences. Living on campus is more than just a bed and a meal plan; it is a lifestyle that promotes learning outside of the classroom, personal growth and development, community support and engagement, and leadership development. Our residences offer a space for students to study, interact, and develop positive relationships, while continuing to reflect on their future goals and purpose. Living in residence is a great way to learn and gain experience outside of the classroom. Becoming involved in your communities is also a wonderful way to develop relationships with peers. 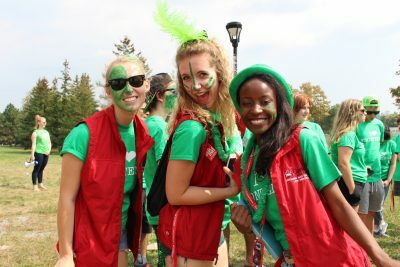 In residence, there are several ways you can do this, including joining Team Green, volunteering as a Mental Health Champion, visiting the Raven’s Roost, and participating in events, programs, and committees in and around residence. Click here to find out more! Residence Fellows help to facilitate opportunities for students to develop, lead, and plan activities for their community to build relationships. These opportunities help us create an intentional learning experience for students, and support in cultivating leaders in our community. We also encourage our students to take a lead role in the creation of these events by designing marketing materials, promoting on and off-campus initiatives, and organizing events based on community interests. This could include movie nights, community art exhibits, sporting events, and many other fun opportunities to bring students together. As a prospective student, it is important to familiarize yourself with our website. To learn if Residence is the right option for you, explore our website’s different sections and be sure to check out our Residence Videos for a closer look at our buildings! If, after reviewing the website, you still have any questions regarding Residence at Carleton University, please email accommodations@carleton.ca and a member of our staff will be more than happy to assist you!